Since its inception, Dr. Dan’s Freedom Forum has been an advocate for the Free Market as a basis for economic growth and upward personal mobility. Individual freedom, the absence of coercion, is derived from combining the ability to choose one’s future course of action with accepting personal responsibility for the outcome of one’s decisions. Competition is the tool of the Free Market, leading to increased quality and opportunity . . . the engine of upward mobility. Inevitably, competition leads either to success or failure. Both are part of the process of the Free Market, and the lessons learned from failure are part of every future success. The Free Market, by providing multiple options, is the nemesis of tyrannical governments. Freedom of Choice is the antagonist of control, and control is what the government desires most of all. To defeat choice, government intervenes in the Free Market to skew the competitive process by preventing failure and creating dependency . . . That’s basic Free Market economic philosophy, Milton Friedman style. Once upon a time in our country, we had true free market medical care. Doctors and patients interacted with each other by the free exchange of goods and services. Competition based on quality, location, availability, and price enabled patients access to the care they needed, and most physicians understood their role in providing healthcare to all. For the most part, the destruction of that system has been achieved by the cooperative efforts of the insurance industry to increase its profits and by state and federal governments to increase control over people. As your physician examines you, a representative of your insurance carrier and a bureaucrat from HHS are in that room with you. They determine the extent and quality of the care your physician is allowed to provide for you. And you have little or no recourse. Unfortunately, we are all victims of misconceptions about medical insurance and healthcare. For instance, having no insurance does not mean that you won’t get healthcare. Emergency Rooms are required to provide care for anyone who requests it, and free or low-cost clinics do exist. Conversely, having insurance is not a guarantee that you will receive care if no provider accepts your plan. As third-party payments decrease for covered services, to remain profitable, providers are forced to adjust parameters by which patients are examined and care is given. It is not feasible to deliver medical care that costs more to provide than the amount insurance will reimburse. 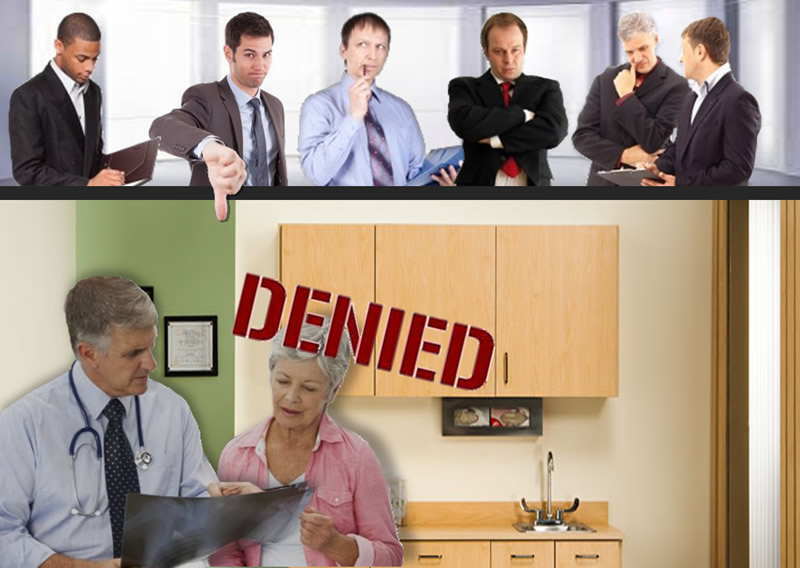 As a result, physicians must bypass complex patients as they transition to a “one-complaint-per-office visit” practice pattern that favors patients with health concerns that are less complicated and time consuming to diagnose and treat. Patients with multi-system disease will find it increasingly difficult to access care, except in large HMO-type clinic settings with long waiting lines and limited care availability. Obamacare does nothing to fix these problems. Instead, it forces all of us into a single-payor system in which care is determined by a set of rules created by bureaucrats based on phony statistics devised to justify ineligibility for care. Sadly, our medical care delivery system, once the finest in the world, will devolve into a two-tier system consisting of the elite and those deemed “valuable to society” who will have access to the best physicians and treatments available, while the rest of us must wait in line for limited access and rationed care. That was the plan all along . . . Obamacare was created by Dr. Ezekiel Emanuel who wrote “The Complete Lives System”, a scheme for denying healthcare to those who are no longer able to contribute to the collectivist utopia Emanuel envisions for our society. The new health care reality is “to provide socially sustainable, cost-effective care”, the results of which will be cruel rationing unless you are a member of the ruling class . . . After all, socialism is for the people, not the socialists. For a preview of the direction Obamacare is taking the American health care system, one need look no further than the VA Hospital System. A recent Veterans Affairs internal audit found 57,436 newly enrolled veterans face a minimum 90-day wait for medical care, and 63,869 veterans who enrolled over the past decade requested an appointment that never happened. I can guarantee that Dr. Emanuel’s name will never be on the secret “do-not-call” waiting list . . . but ours will. *See more from Dr. Dan Eichenbaum and listen to some fascinating PODCASTS at DrDansFreedomForum.com.